CST Inc., a 25 years privately owned Memory Tester Company has announced it will demonstrate its New DDR3 1066 Mhz SODIMM Application Tester at the Taipei Computex Show schedule from June 2 - 6, 2009. CST have started deploying multiple units of the DDR3 1066Mhz SODIMM Memory Application Test Solution at several major OEM Memory Manufacturers in the US. This makes CST, Inc. the first in the industry to provide a Low Cost Real-Time Motherboard Test Solution for the latest DDR3 204-pin unbuffered SoDIMM memory module. The new DDR3 1066Mhz SODIMM Application Stand-alone Tester is capable of testing PC3-6400 (DDR3-800Mhz), PC3-8500(DDR3-1066Mhz) and PC3-10666 (DDR3-1333Mhz) SODIMM Memory Modules using an actual "Real-Time" Motherboard Test Environment. 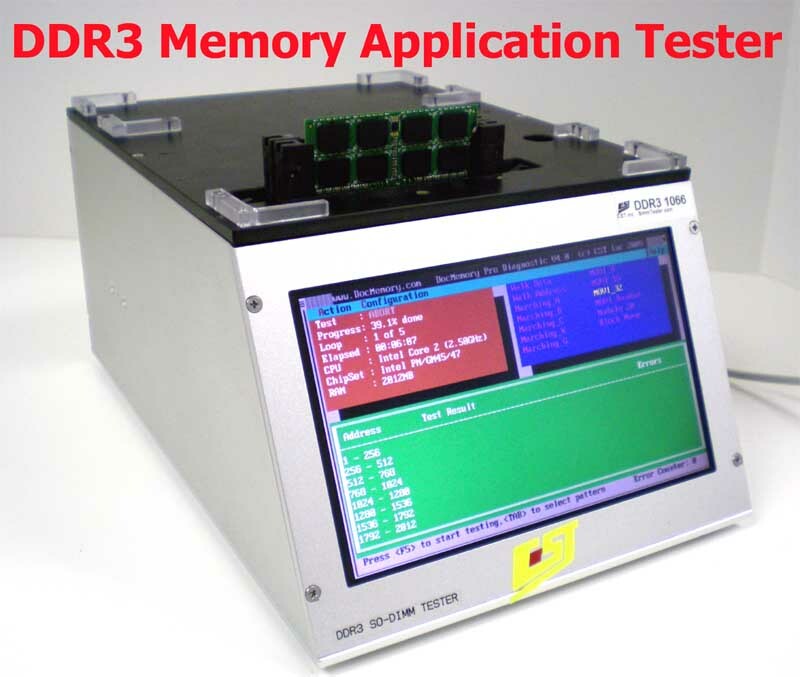 The Memory Application Tester is DDR3 1066Mhz Ready ! PC Memory failure is one of the most difficult system functions to troubleshoot, test and for validation. As PC’s Memory density have been increasing, often System hardware and software failures can very difficult to detect if a problem is truly a RAM related failures. Such problems can be influence by different combinations of CPU type, different brand of chipsets or different types of motherboards. The DDR3 SODIMM Application Tester is powered with the latest CST 's DocMemory Pro Diagnostic Software and it is capable of meeting all of the current Memory Test Challenges. DocMemory Pro Diagnostic will be offer in two version -- PCI Card or USB Flash Stick. Blue screens during the install procedure of Windows 2000 ,XP or Vista. This is one major signs of faulty memory. Random crashes or blue screens during the running of Window 2000 ,XP or Vista. Crashes during memory intensive operations. 3D games, Benchmarks, Photoshop,Cad Software application.... etc. Distorted Video Graphics on Monitor screen. This can also be related to the video card. "CST new 1066Mhz DDR3 Application Tester solution will offer major memory OEM manufacturers the opportunity to improve the Quality level of their backend memory testing and QA/QC verification at a very low cost, said Sun, Senior Sales Engineer at CST Shenzhen". The "DDR3 SODIMM Application Tester" is built with an actual Intel Motherboard system equipped with custom heavy duty test sockets, integrated video,keyboard, USB port and univeral power supply. With a simple push button to start testing, the Application tester quickly boots-up and displays the memory size , CPU Clock and Memory frequency and quicky test the Memory module.. The "DDR3 SODIMM Application Tester" provides added powerful troubleshooting tools capable to pin-point bad error bits location very accurately. Large Memory Distributors and Resellers. CST is accepting orders now for the DDR3 SODIMM Application 1066Mhz Tester with a 4 - 6 weeks delivery leadtime..
CST, Inc. headquarters in Dallas, Texas, USA also has direct offices in Singapore, California, China as well as global distributors strategically located in Canada, China, France, Germany,Austira,Spain, Portugal, Hong Kong, Japan, South Korea, Switzerland, Sweden, Taiwan,Singapore, Malaysia and Israel. For further information, visit www.simmtester.com or call our Sales at <?XML:NAMESPACE PREFIX = SKYPE />(972) 241-2662.